Lawrence Davenport lives a fortunate life. He has a brilliant career, an enviable home, a devoted wife, and so much more. But Lawrence Davenport also has a brutal secret. After three years, Emmet Navar is still grieving the death of his wife. Month by month he puts more pieces of his outwardly simple world back together, dedicating himself to his boys first and his firm second. The woman they both know is battling demons from her past, demons in the present, and demons she is sure will rear in her future…and the future of those now close to her. Many days she allows herself to be fooled to believe her life is normal…even happy. Full of suspense, adventure and humor, you ll fall in love with the characters at every twist and turn in Merciful Law. It is the perfect blend of male and female, action and romance. As the story unfolds, you will wonder who will win, who will lose, who will live and who will die. 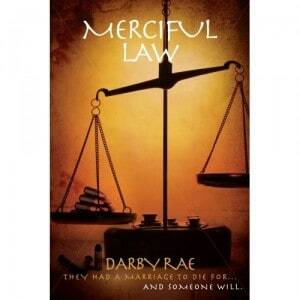 Merciful Law…they had a marriage to die for…and someone will. I was immediately pulled into Merciful Law. The first chapter immediately puts you in the head of Lawrence, the man who is devastated by the disappearance of his wife. I wasn’t expecting the intense emotion that he felt or the violent behavior, but it helped the reader to immediately grasp the situation that Deborah (or Annie as she is known through most of the book) was running away from. I felt myself cheering her on, hoping that she could successfully get away from Lawrence. The first half of the book was brilliant. I loved reading Annie’s accounts as she established a new life for herself, particularly as she entered the life of Emmett and his two adorable sons. I read the first half of the book in one sitting. I was just drawn to these characters and I wanted her to fall in love with Emmett, for her life to have a better happily ever after. Unfortunately, the second half of the book wasn’t what I had hoped for. The synopsis leaves no doubt that there is romance in this book, but the romantic aspect was more than I had expected, and it came on so fast. Well, the relationship didn’t, but once the relationship was established the intensity of it was kicked into overdrive. I had a hard time cheering for either one of the men in Annie’s life. I didn’t want Annie to return to Lawrence, but Emmett felt extremely controlling and overprotective as well. The two fought a lot and I only felt that Annie was happy half of the time. The ending of the book also didn’t feel very believable to me. I don’t want to go into any spoilers, but I just didn’t feel like that is really what would have happened. In another world the ending could be believable, so I’ll just imagine that in Annie’s world it works. On a positive note, the epilogue was great and it helped me to finally find peace with Annie’s choices and it helped me to not be frustrated as I walked away. I really liked the idea of this book. I enjoyed the dialogue and I loved most of the characters, I just wish it had ended a little differently. Darby Rae has talent and I will definitely read anything else that she writes.